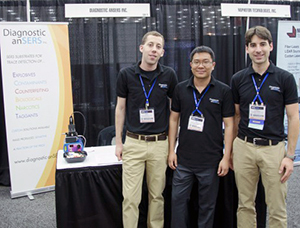 The Diagnostic anSERS entrepreneurs at SPIE DSS 2014. L-R: Sean Virgile, Wei Yu, Eric Hoppmann. Surface-enhanced Raman spectroscopy (SERS) is a molecular fingerprinting technique that works at extremely small trace concentration levels. By applying a sample to a SERS substrate sensor and measuring the fingerprint with a handheld spectrometer, molecular identification can be carried out at the parts per billion level in under a minute. Until recently, SERS has not been widely used because of the high cost of commercially available SERS substrates, typically $50-100 per disposable sensor. P-SERS™, a technology invented at the University of Maryland by Assistant Professor Ian White’s (Fischell Department of Bioengineering) research group, is the foundation of Diagnostic anSERS. It is is a low-cost, on-demand, and portable version of an advanced sensor technology that is typically a high-end investment and confined to a lab. Diagnostic anSERS was founded by BioE alumnus Dr. Eric Hoppmann and current BioE Ph.D. student Sean Virgile, and includes BioE alumnus Dr. Wei Yu. All three studied with White, an affiliate faculty member of the Institute for Systems Research. P-SERS™ is the first SERS sensor that is both cost effective, at a few dollars per test, and highly sensitive, outperforming the $100 market leader by 10-100× in independent testing. While existing substrates are rigid sensors on silicon wafers, P-SERS™ substrates are flexible and can be used as dipsticks or surface swabs as well as a cost-effective alternative to existing silicon wafer substrates. Diagnostic anSERS is able to achieve this combination of low-cost and high sensitivity through a patent-pending technique in which roll-to-roll inkjet printing is used to precisely deposit special nanoparticle ink onto paper and other flexible support materials. The sensors can be used to detect a wide variety of molecules, including drugs, explosives, food contaminants and taggants for anti-counterfeiting. Custom sensors can be produced, optimized for detection of targets such as biological markers which are difficult to measure and/or require ultra-high sensitivity. Tests which previously would have required samples being sent to centralized labs, with the consequent multi-day wait and high price tag, can now be performed on-site. Affordable access to this class of ultra-trace detection enables practical screening in a wide variety of applications. P-SERS™ research was recently featured as the cover article in the journal Analyst. The researchers demonstrated detection of malathion, an organophosphate (class of insecticides and nerve agents) at 413 picograms. They also demonstrated detection of heroin and cocaine at 9 and 15 nanograms, respectively. Notably, these dipsticks and surface swabs were shown to provide repeatable, quantitative measurements, reporting the amount of drug residue on the surface, not merely presence/absence. P-SERS™ premiered at SPIE DSS 2014, a global conference on sensing for defense, security, industry, healthcare and the environment, held at the Baltimore Convention Center this May. More information about P-SERS™, including a technical white paper, is available at the Diagnostic anSERS website. If you are interested in reading the journal publications that led to Diagnostic anSERS’ intellectual property, they are available here (Analytical Chemistry), here (Analyst), here (also Analyst) and here (Methods). Thanks to the Smith School’s Dingman Center for Entrepreneurship and the UMD Vice President for Research’s office for alerting us to this story. Co-founder Sean Virgile has an ongoing relationship with the Dingman Center. He and Diagnostic anSERS have been advised there, have competed in Cupid’s Cup, become a Fearless Founder, and moved into M Square Research Park. The company also receives support from the Clark School’s Maryland Technology Enterprise Institute (MTECH), where it is advised by VentureAccelerator Director Craig Dye. Diagnostic anSERS Pitches Dingman...and Wins!